On Saturday night I ran Auslogics Registry Cleaner again. It had been 4 days since I had last run it. Since it is the ONLY registry tool that I now have on my Windows 7 machine the Registry had not been cleaned since I last ran Auslogics. I ran the Registry Cleaner in ‘Advanced Scan’ [i.e., scan everything] mode. Didn’t take long. Said I had 10 errors. That surprised me, but in a good way. When I had System Mechanic 9.5 I used to run it most nights before I would Shut Down the PC. Invariably, with monotonous predictability, I would always be told that I had between 12 and 22 registry errors that needed to be fixed. Most nights I would tell SM to fix it. Then the next night I would have much the same amount again. I checked the list of 10 errors found by Auslogics. Six related to Word documents that I had renamed (reflecting their new status within the proofing cycle). So that made sense. So 60% of the errors were beyond kosher. The other 4 looked reasonably legit too. That the Auslogics Registry Cleaner found less errors after a 4 day hiatus than SM used to find in a night … leaves me in the proverbial no man’s land. Who is right? Which is better? But, at least Auslogics as yet to hang. So that is a definite plus. It is possible that it is not as thorough as SM. I hope it is, but right now I don’t have the time to determine if Auslogics skips records that SM would analyze and report. Time will tell. I then downloaded and ran the Auslogics Disk Defrag. I had used it on XP so I knew what to expect. I did an analyze. It came back and said that I DID NOT need to defrag my C-drive. That was good. Unlike its Registry Defrag which does NOT have an option for insisting on a defrag … the Disk Defrag does, Praise be to Shane (though Mulli’s KING), have that option. I adjusted the settings so that it did not try to defrag 10MB or larger segments. I also asked it to DEFRAG & OPTIMIZE [i.e., move my System Files towards the ‘front’ of the disk]. My C-drive is a ‘nominal’ 750GB … with 42GB currently used. I think it found close to 12,000 files — 90 of which needed to be defraged. When I came back it was done. It had taken 46 minutes and 14 seconds. That is probably not bad. They give you fairly impressive report. I had a quick glance at it. That too looked Kosher. So far, so good. No hangs. My system works. It hasn’t made any difference to my performance but my performance is OK … given that this is a i7-920 with 12GB of DDR3 memory. I found to my cost and chagrin that the Auslogics Registry Defrag will install itself on ‘top’ of an existing version without any warning message or an attempt to uninstall the installed version. Though this was MY FAULT, I was not amused. I did the Disk Defrag download past midnight. All my downloads go to my ‘DOWNLOADS’ folder. I had been indexing my book for over 2 hours. Trust me, there is nothing guaranteed to screw-up your eyesight like heads-down, indexing. I had 4 install execs in my folder. I clicked the wrong one. Instead of activating the new Disk Defrag .exe, I without realizing (of course) clicked on the Registry Defrag. The installation went through WITHOUT any mention that I already had a PERFECTLY good copy of Registry Defrag installed on my machine. That was NOT GOOD. Not amused. Registry Defrag install exec NOT checking for a prior install. Bad, bad, bad. Registry Defrg not having a ‘do a defrag any way’ option (for Power Users who know what they are doing). This is an annoyance. Auslogics BootSpeed finding errors on your machine BUT then saying it won’t fix them until you buy a license. That is bad. That is duplicitous since it doesn’t warn you of this before you fire it up. It is childish. It is NOT CRICKET. It is Greg Chappell bowling underarm. It is Rod Marsh betting against his own team. It is Kim Hughes crying like a 4 year old on TV. Windows 7: Built-In ‘Troubleshooting’ & System Maintenance Tools? Windows 7 does include this ‘System Maintenance’ tool. 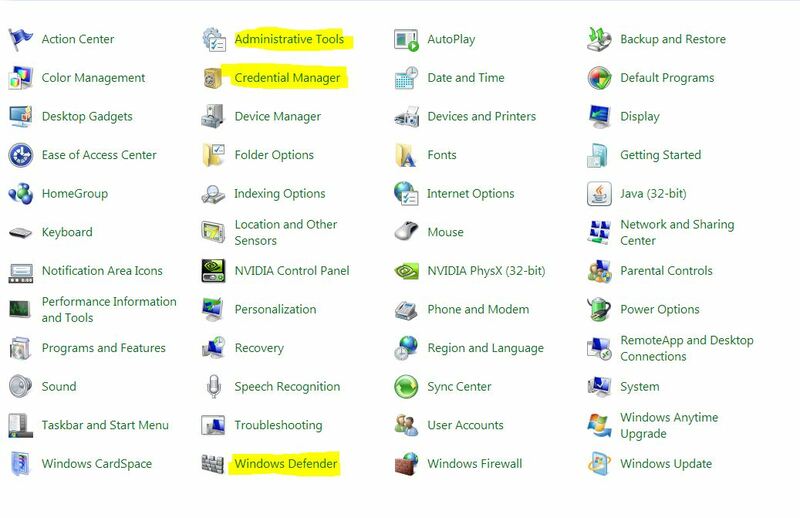 Microsoft has done a very nice job burying it deep within the CONTROL PANEL so that most will never find it. Maybe that is a good thing. If you want to try it, you have to invoke the CONTROL PANEL ‘All Items’ display option. Read this post. It shows you what to do. Given my experience with TuneUp Utilities 2010, I had thought that MAYBE Windows 7 might find some broken shortcuts — given that I have not run ANY PC tools on this Windows 7 rig in 5 days, now that I uninstalled System Mechanic 9.5.5 on January 22. But, nothing. Tells me that my system is FINE. Well, tomorrow, with luck, I will install some Auslogics’ tools on this system. Please keep your toes crossed for me. Good luck. Thanks & Cheers. Last night, around mid-night, as I was about to shut-down an ‘Adobe Updater’ icon popped up in my Task Bar tray … and notified me that Acrobat had an update. So went through the process. It demands a restart. Worked OK. No glitches. Just to make sure all was well I opened a recently created PDF with 9.3. Opened fine. This morning I re-created a PDF using 9.3. No problems, yet. But, the PROMPT screen to ask me where I want the new PDF still appears BEHIND the Word document. (Yes, the Task Bar icon flashes to tell you that something needs to be done.) I had hoped that Adobe would have fixed that in 9.3. Yes, I went and found the release notes for 9.3. Didn’t enlighten me much, BUT I thank Adobe for having them. iolo PLEASE take note. Since starting this post … given that I have to multitask … I have created a couple more PDFs, all trivial, using 9.3. No problems, BUT these were one page documents [think, invoices << smile >>]. This update to 9.3 has been NICELY integrated with Windows 7. Windows 7 Action Center has it noted as a change to the system. It even appears in the Windows 7 Update History. This is good. This is impressive. In contrast none of the updates to iolo System Mechanic 9.5 are reflected in the Action Center or Windows 7 Update History. So, so far so good. But I don’t trust Adobe. As I am about to die, Adobe will be the last thing that will flash before my eyes. I will remember that all the problems I have had with Adobe, over the years, would have taken at least five years of my life. Thanks & Cheers. Good luck. Contrary to what my wife claims, I do not relish being this right … most of the time. As a papal historian I cherish the challenges of fallibility. Well it didn’t take as long. Just a week. Last thing at night, before going to bed, I run System Mechanic. So last night I got 9.5.2 around 12:20am. Yes, I installed it, restarted the system and even did a deep analysis. Hhmmmm. Interesting. It appears to be working harder trying to find ‘unused files.’ Noticeable. That is about all I could detect was different. Well, I won’t bore you with all the links, but if you are interested I have been accurately calling each of these SM updates, since Windows 7 hit the streets. Well, I will make another call. We will most likely be at 9.5.4 before January 1, 2010. But, I hope I am wrong. Just a week earlier, when we were still on 9.0.5, I had said it is time we got a new release. Well, it is scary that I know SM this well, BUT I got a new release TODAY. I am now up to 9.5.1. Ran it. Defrag seems to be SLIGHTLY better. One thing though. iolo, possibly in cahoots with MSFT, has changed the Windows 7 ‘confirmation’ that was previously required to invoke SM! Now, SM starts like say Office. You don’t get a prompt asking whether you want to run it. Not sure about that. But, I don’t think 9.5.1 will be with us for long. I am sure we will be at 9.5.2 before Christmas of this year … and I think Christmas is like 3 weeks away. Of course, I will keep you posted. Well I gave you all a heads-up and fixed my system before I went to bed … at 11:40 am Eastern (US) this morning. Since I had thoroughly tested out System Mechanic 9.5 before I retired, I was confident that I was going to be ‘OK’ this morning. So I didn’t vary my routine. I went for my usual run, before I checked the system. A local PC guy, a big fan of Avast and all things open source, had sent me an email telling me I should not panic … that there was a bug in Avast. I was happy to tell him that I was way beyond that by that point. Unlike me, who only had System Mechanic whacked, he had had quite a few files quarantined as being infected. As I suspected, the Web was full of stories of the Avast false positive. Avast even posted an apology of sorts — though I get the feeling they called up Tiger Woods to ask his advise on how to word it. Actually, I had got a false positive on them, on THIS BLOG, a couple of days ago! Told me there was a trojan. Well, I knew that that could not be the case. This is WordPress.com. So I ignored that. Next time I clicked … nothing. So I knew that it was a false alarm. I am in a quandary. Avast, in general, has been good. I know how it works. Having seen MANY talk about it … I checked out Avira. Not sure that it gives me all I get with Avast Professional. My Avast/Open Source friend still swears by Avast. Most people are comparing and talking about the FREE, Avast Home edition. That is for kids cheapskates. So much of the talk is about FREE Avast, free Avira, free AVG and free Microsoft Total Security. Not interested in the free stuff. I want industrial strength protection. Still torn about what to do. All I do know is that Avast screwed up BIG TIME. Shame on them. Just call it my gut-feel intuition, but System Mechanic 9.5.0 is still not right! Yes, iolo might have fixed the most blatant stability issues and jazzed up the user-interface icons BUT 9.5 appears still to be a rush release. I put 9.5.0 to the test again today. I am making good progress on my book and I am now way ahead of my intrepid proof-reader. So I have a bit of spare time in my life, a rarity indeed. So I am using some of this ‘spare’ time to get to know the nooks and crannies of my system. A full analysis of the system again reported 3 problems. I knew what they were without even looking. The usual: x registry errors, 1x MB clutter and 1x% c-disk defragmentation. This time, I used Windows 7 defrag … and then went to have lunch … consisting in the main of cheese cake and caramel apple pie. Hey, I have been running every day. And I only eat sweets during holidays. Not really my fault if our guests didn’t finish the 6 pies that I bought and the big cheese cake my wife made. When I got back sated, Window said that I had 0% fragmentation. Bingo. But, I trust nobody, when it comes to software or PCs. So I cranked up SM 9.5. Man, they have got their act together. Said NOTHING about needing a defrag. Obviously they have a hook in with the Windows 7 defrag. When you run that 9.5 lets you off the hook. But, did I already say that I don’t trust anybody when it comes to software? I ran 9.5 AGAIN and told it to do a deep analysis … for the second time in like 2 hours. Now I hadn’t done anything on the PC since Window 7 did its defrag and said 0% … and 9.5 didn’t say I needed to defrag. 9.5 now said I had 17% fragmentation. I let it go. This system isn’t exactly slow. But, I knew something was wrong. I then had to do other things. Yes, I finished Appendix E of the book. I climbed a tree and cut a large branch off since it was close to my utilities lines. We hung up Christmas lights, etc. etc. I was going to write about Windows Defender. Actually did some research on it. Theories, and that is what they will always be, about defrag have changed over the years. It is no longer that important that an entire file is stored in contiguous sectors. Think about. So starting with Vista Microsoft reports defrag percentages DIFFERENTLY. Bingo. Why it said 0% and SM 9.5 said 9.5. I looked at the files that 9.5 can’t defrag. They are, in the main, System Volume Information related files. My c-drive at 750GB is BIG. The System Volume Information files are also BIG. And I think that is what is screwing SM. The larger the drive, the larger the System Info files that SM can’t relocate! SM needs to FIX it defrag. OK? I had noticed this from day 1. The first time I try to save to my 2nd disk, d-drive, from Word 2007, it takes an AGE. After that it is as quick as it can be. I have a feeling that Windows 7 caches SOME volume information about drives in memory before you get to use the drive. With the c-drive this must get done during BOOT, this being my system drive. So this must be why there is always a palpable hesitation before my first use of the 2nd drive. Not killer. More a source of amusement that Windows 7 has to think about it. My second drive is also 750GB. So I think the size impacts the amount of data that Windows 7 caches. I will look into this too. My recent papal books. PLEASE buy. Please buy these books to support and fund this BLOG. Thank you.